The Folger Institute is delighted to announce a fellowship in partnership with the American Society for Eighteenth-Century Studies. This $2,500 award will allow its recipient a one-month residency at the Folger Library in Washington, DC. The fellowship is interdisciplinary, and will work to support all areas of scholarly inquiry pertinent to eighteenth-century studies. Established in 1969, the American Society for Eighteenth-Century Studies is an interdisciplinary organization dedicated to the advancement of scholarship in all aspects of the period from the later seventeenth through the early nineteenth century in Europe, its colonies, and across the globe. The activities of the Society include an annual meeting that brings together hundreds of scholars in all fields of eighteenth-century studies; an annual volume, Studies in Eighteenth-Century Culture, that publishes the best papers presented at the annual meeting and meetings of its affiliated and regional societies; and a quarterly journal, Eighteenth-Century Studies, the premier journal in the field. ASECS and its wide range of caucuses (Women’s Caucus, LGBTQ Studies Caucus, Race and Empire Caucus, Graduate Student Caucus, Cultural Studies Caucus, Theater Studies Caucus, etc.) award prizes annually to members who have made significant contributions to research and teaching on the eighteenth century. In addition, ASECS is pleased to award multiple travel and research grants every year to its members, including fellowships in partnership with libraries such as the Folger whose collections support research in eighteenth-century studies. The Folger’s collections offer many avenues of research for scholars of the long eighteenth century. The Folger has excellent collections of eighteenth-century visual art, furniture, and ephemera. 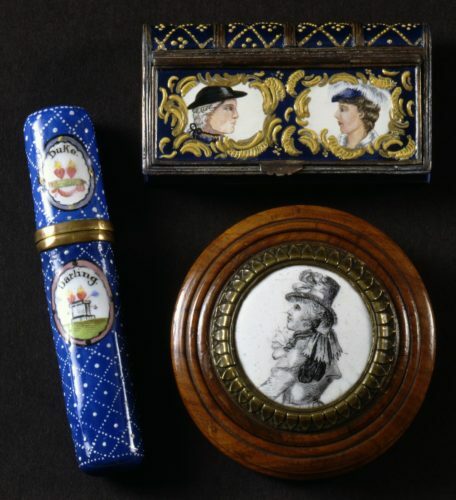 These include printed lampoons by American, British, and French artist-publishers such as Bryan, Cruikshank, Fores, Gillray, Hogarth, Marks, and Villain, and also art objects like scent bottles, pomade tins, porcelain snuff boxes, silver tea caddies, and ceramic patch boxes, often decorated with images of actors and actresses from the period. (left) Bilston enamel bodkin case of Dorothy Jordan and the Duke of Clarence, ca. 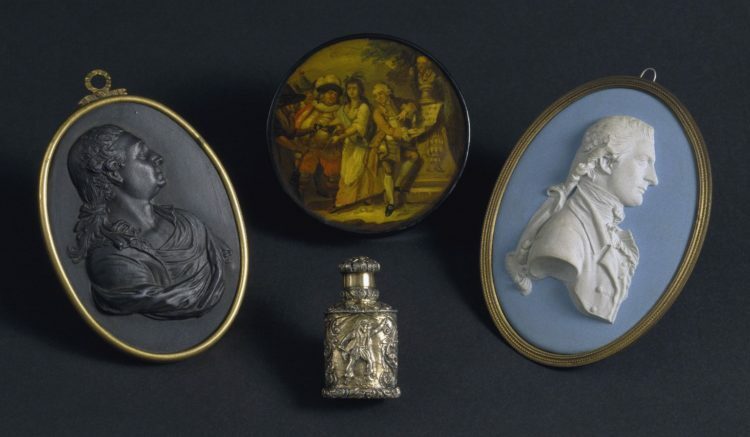 1795 (verso); (top right) enamel patch box of Dorothy Jordan and the Duke of Clarence, late 18th century; (bottom right) turned wooden box with a Bilston enamel portrait medallion of Dorothy Jordan, ca. 1790. (ART 241293 (realia), ART 241294 (realia). From the Craven Collection. 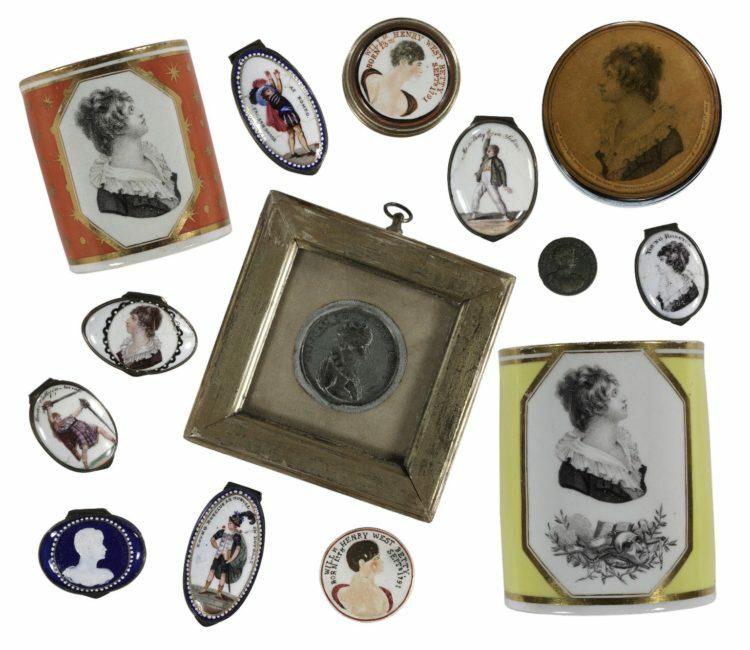 Enamel boxes and other objects depicting “Master Betty” (William Henry West Betty), circa 1805, from the Craven Collection. Evidence of the correspondence, books, and printed pamphlets, treatises, and tracts which helped to make up the Republic of Letters are also featured in the collection. Manuscript correspondence in French, German, English, and Italian (including by d’Alembert and Voltaire) provides information about the circulation of books, the exchange of ideas, and the intellectual and artistic activities of the Académie Royale des Sciences et Belles-Lettres de Prusse in Berlin, the École Militaire in Paris, and the Comédie-Française. There are also many sources which help to explicate exchanges of information about science, medicine, and the natural world; these include Antoine de Jussieu’s 1771 Traité des vertus des plantes, and a 1766 edition of Bauhin’s Histoire des plantes de l’Europe, et des plus usitées qui viennent d’Asie, d’Afrique & d’Amérique, and a 1770 edition of Jacob Christian Schäffer’s Erleichterte Arzneykräuterwissenschaft. But the Folger’s most comprehensive eighteenth-century collections relate to theater history, musicology, and performance studies. These include printed plays, prompt-books, costume designs, and theater advertisements. The Folger holds the records of London’s Drury Lane and Covent Garden Theatres, including ticket books, nightly accounts, pay-books, records of the wardrobe keepers, lists of subscribers, and inventories from both of those companies. Scores from operatic productions, including those by William Bates and Daniel Purcell, are joined by anonymous compositions such as The Merry Musician; or, a Cure for the Spleen (London c. 1733). 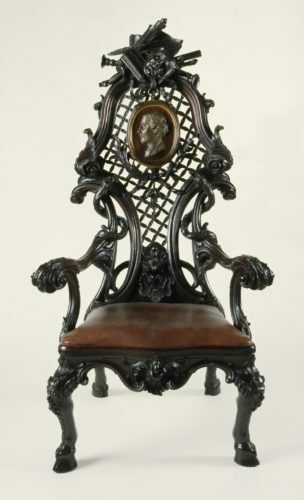 The Folger’s enormous collection of David Garrick material includes manuscript correspondence, papers, and books owned by the actor-manager, plus the “President’s Chair of the Shakespeare Club” designed by William Hogarth for Garrick’s Temple to Shakespeare at Hampton. The Folger also houses the Babette Craven Collection of Theatrical Memorabilia, a group of approximately 300 souvenir items related to the 18th and early 19th-century English stage that was donated in 1997. This group of porcelain figurines, transfer-printed tiles, medallions en grisaille, commemorative prints, decorative tableware, Wedgwood portrait medallions, and more, is particularly strong in representations of William Henry West Betty (“Master Betty”) and John Liston’s “Paul Pry” character. Scholars who wish to apply for the ASECS-Folger Institute Fellowship should apply directly to the Folger as part of the Short-Term Application process. They must be members in good standing of ASECS at the time of the award. Amanda Herbert is an Assistant Director at the Folger Institute of the Folger Shakespeare Library, where she runs the Fellowships Program. She holds the M.A. and Ph.D. degrees in History from the Johns Hopkins University, and completed her B.A. with Distinction in History and Germanics at the University of Washington. Her first book, Female Alliances: Gender, Identity, and Friendship in Early Modern Britain, was published by Yale University Press in 2014 and won the Best Book Award from the Society for the Study of Early Modern Women. She was the 2015-2016 inaugural Molina Fellow in the History of Medicine and Allied Sciences at the Huntington Library in San Marino, California, where she worked on her second book project, Spa: Faith, Public Health, and Science in Early Modern Britain.